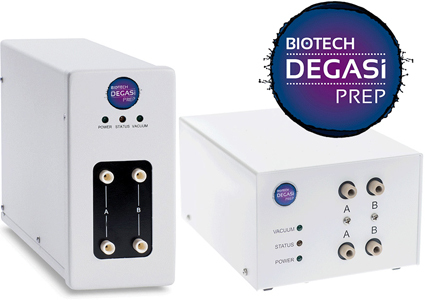 The DEGASi PREP vacuum degassing system for analytical instrumentation and HPLC removes dissolved gasses at flow rates up to approximately 50ml/min per channel. Built for the rigours of modern preparative and semi-prep scale HPLC, its unique design assures reliable continuous operation and the highest level of continuous performance available. The low internal volume of each Systec AF channel offers quick equilibration and short startup times compared with PTFE degassers.